Containing both low voltage and high voltage subsystems, the CableEye HVX permits expanded testing for insulation resistance, dielectric breakdown, & Zener diode breakdown voltage, and can be upgraded for capacitance and/or 4-Wire measurement. After checking for opens, shorts, miswires, and resistance limits, the system applies a user-selectable voltage to each connection group in the cable - from 10 V to the maximum dc/ac voltage. Ramp Up, Ramp Down, Dwell Time (same as Test Time), Trip Current, and Trip Delay (same as Soak Time) may be programmed for your specific requirements. Leakage current detected during the high voltage test phase provides a measure of insulation quality. Insulation resistance up to 1 GΩ or 5 GΩ may be recorded. Any leakage current exceeding a preset limit reveals the presence of moisture, flux, or other contamination on exposed contacts. Low voltage resistance thresholds can be set for contact resistance down to 0.1 Ω, and for isolation up to 5 MΩ. Measure embedded resistors from 100 Ω to 1 MΩ with 1% accuracy, and lesser accuracy from 0.1 Ω to 5 MΩ. LV measurement takes less than 0.5 s.
Robust hardware includes: A TEST pushbutton with READY, PASS, and FAIL indicators for one-button operation; Signal remote control and test probe sockets; External Terminals for basic insulation testing on chassis and individual components; Industry-standard 64- pin dual-row latch headers for easy interface to external test fixtures of your own design for custom applications; USB Communication; and a rugged, 1/16”-thick aluminum case with scratch-proof Lexan surface for long life in an industrial environment. A simple, in-built scripting capability permits full production-testing automation from test through reports and labelling. Program optional external relay boards to switch diverter gates, lock and release latches, and more. Program Ready, Pass, and Fail signals to operate tower lights, LEDs, audible tones, label printers etc. Use optional API & LabView interfaces for integration with other equipment. HVX series testers allow users to meet industry-standard A620 guidelines for cable and wire harness testing. 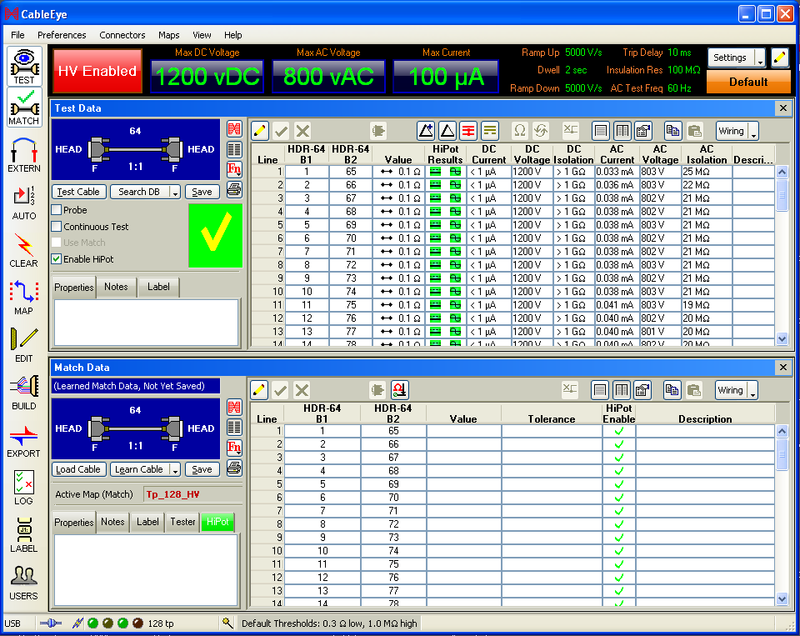 The system also produces archival-quality reports for each cable tested showing user-selected test parameters such as the test voltage, leakage current, and insulation resistance for each wire group, and clearly denotes PASS or FAIL at the top of the report. The system employs numerous measures to ensure operator safety. Each login name must have system administrator authorization to permit enabling of the high voltage function. Once logged in, the operator must confirm awareness of the presence of high voltage by pressing a hardware-enable button for that test session. During testing, a bright red light bar turns on when high voltage is present. If desired, remote test and stop switches are available. Finally, test current that exceeds the maximum 1.5 mA causes an automatic halt of that test and cessation of voltage. What are the alternatives to CableEye and how do they compare? Who benefits from using the system? How does testing with CableEye increase productivity? Can all cables/connectors be tested ...? How much time can be saved ...? How much more productive will a user be ...? Read now! Learn how to choose a cable & harness tester that remains relevant as product design changes in addition to providing fast, reliable, accurate results. See how it can improve productivity even beyond the production floor. Read now! Base Unit 60 W maximum. Base Unit with three expansion modules 175 W maximum. Compatible with touchscreen PCs including laptops. Base Unit Size: 12.5" wide, 18.5" deep, 3" high. 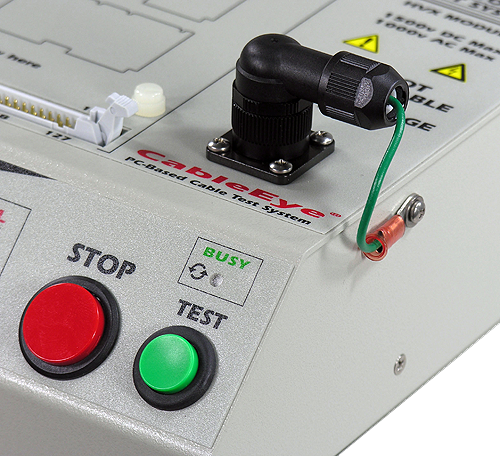 An add-on option for the CableEye HVX high voltage cable tester that permits expanded testing for contact and wire resistance as low as 1 mΩ. After checking for opens, shorts, miswires, and resistance limits, the new 4-wire Kelvin measurement applies a user-selectable test current from 10 mA to 1 A to determine connection resistance within 1 mΩ. The resistance profile of a model cable may be stored and used as a basis of comparison during later testing to reveal cold solder joints, faulty crimps, recessed pins, pin contact contamination, improper wire gauge, and stress-extruded wire. Four-wire measurement eliminates any effect of fixture resistance to obtain a precise value of the unit under test (UUT) resistance only. The same high-accuracy measurement may be obtained with a short fixture attached directly to the tester, or with a large wire harness fixture that may extend a considerable distance to reach the UUT. Users may optionally set up a high-current stress test for wiring by driving up to 1 A of current through each conductor, and setting a dwell time from 100ms to 3 min. Increasing resistance during the dwell period may show problems not detected with a shorter measurement interval. This option may be purchased with any new HVX tester, or added as an upgrade to any of your existing HVX testers. A How-To Guide: Using 4-wire Kelvin measurement technique to improve cable quality & reliability. Read now! 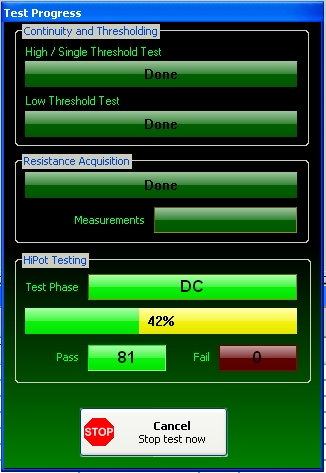 Screenshot of 4-wire resistance test data screen. The header displays the applied test parameters. See Previous Topic for tester specifications. 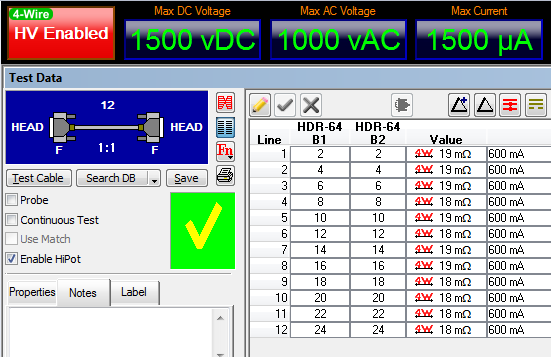 After login, press the HV Enable button (center) to enable the system for high voltage (HiPot) testing. Then, either learn a cable attached to the tester, or load a previously stored cable from the database, and press the TEST button to initiate a test. Repetitive testing can be controlled entirely from this front panel without referring to the computer screen or keyboard. Large, bright Pass and Fail indicators summarize the test result. A large, red High Voltage indicator turns on when high voltage is applied to the test cable. A fast linear hipot scan checks 13 nets per second. Full DC or AC scans permit adjustable ramp up and ramp down rates, trip current, trip delay (soak time), and test time. Group scan algorithm also available for very fast scanning. 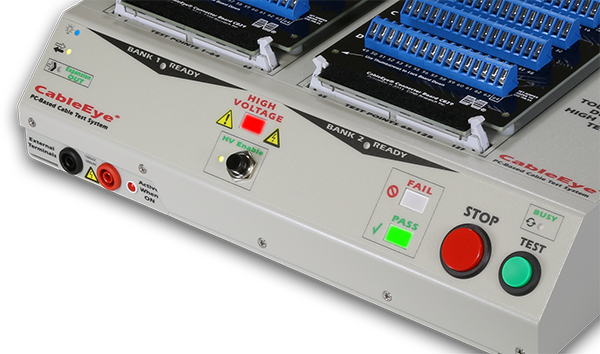 Use these external terminals to perform basic safety testing on chassis, panels, transformers, or other applications requiring a single channel test. The bright red indicator you see to the right of the terminals turns on when you select the external terminals for output. When using the external terminals, the headers normally used to attach connector boards or flat cables are internally deactivated. The external terminals may also be used to easily check the system's voltage accuracy, and for calibration without removal of the cover. The slot in the lower left corner of the base is the front attachment point for optional high voltage expansion modules that connect to the bottom of the main unit. Separate USB channels control the low voltage and high voltage circuitry. Both USB cables must be connected. The Remote socket provides access for a footswitch, remote test switch, single-bit relay I/O, and external signals for Pass, Fail, and Ready states, as well as 5 V external power for accessories. 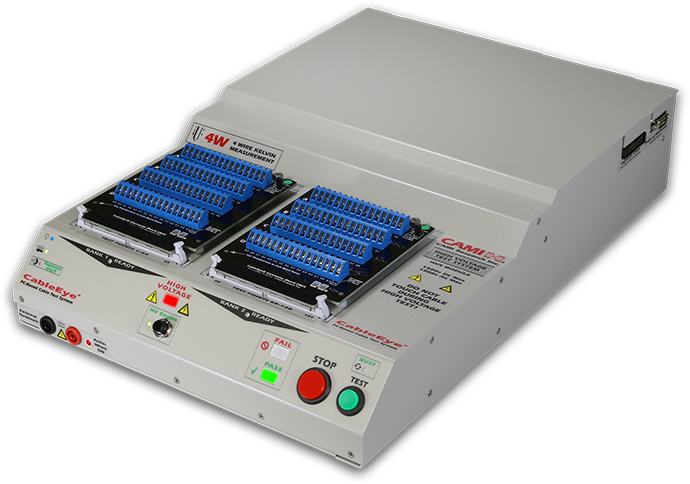 Add test points to an HVX series system with Expansion Modules. This photo shows a 128-point expansion module added to the base unit. 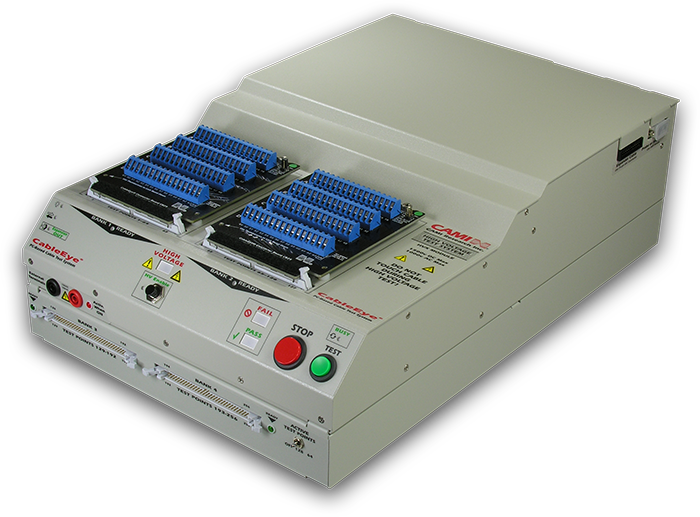 The system can be expanded to 1024 (HVX) or 512 (HVX-21) test points by stacking further expansion modules. In this photo, CB29 Screw Terminal boards are plugged into the base unit on the top. You may attach our QuickMount housing to the expansion modules to provide additional board mounting positions. An overview Click to read. A dummy plug is included that is required for normal control. Replace the dummy plug with an external cable leading to your own controls when remote is used. A matching connector, identical to that shown for dummy plug, is included with this option for wiring to your remote cable. An indicator panel at the top of CableEye's control screen shows the present hipot settings. One test cycle can include any combination of a Fast DC Test, Full DC Test, and AC Test. Additional columns may be turned on in the net list to show actual DC voltage, DC current, DC isolation, AC voltage, AC current, and AC isolation. You may test AC at 60 or 50 Hz. 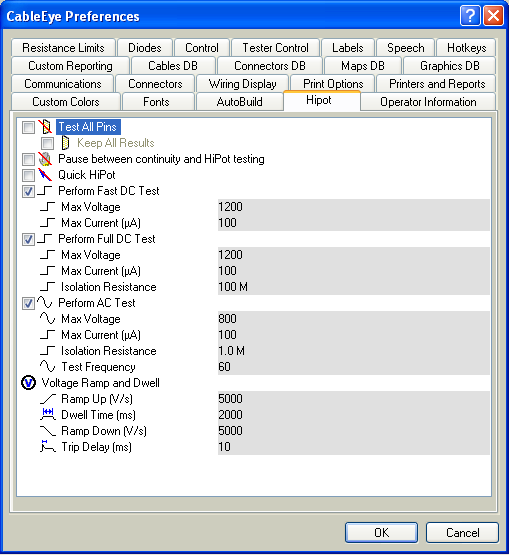 This control screen sets the desired test types, voltages, and limits, and holds default values when you learn or enter a new cable. You may override these default values with custom values unique to that cable and store any changed settings with the cable in the database. Select the test you wish to perform, and set the voltage and current limits as desired. Test voltage may be adjusted from 10V in 1V increments to the model's maximum voltage: 1500 Vdc and 1000 Vac for HVX, and 2100 Vdc and 1200 Vac for HVX-21. The maximum current may be adjusted from 25µA (DC), 50µA (AC) to 1.5mA, and the isolation threshold set up to 1GΩ (HVX), 5GΩ (HVX-21). Choose the lowest trip current possible for cable under test to minimize insulation damage in the event of dielectric failure. The Ramp times specify how fast the test voltage is reached when starting a test and how fast the cable is discharged when the test finishes. This may be adjusted between 150 V/s to 5000 V/s. Smaller ramp rates are needed for assemblies that exhibit high capacitance. Choose the test frequency to correspond with the power line frequency under which the cable will be operated. Learn how parasitic capacitance can affect your safety and the accuracy of your results when testing cables longer than 10ft. Click to read. This pop-up window appears on the screen during a test to summarize which test types have been performed, which have been completed, and the progress of the test currently underway. The window disappears when the test is complete, and the final pass/fail count appears in the Test Data window. The HVX System has undergone a rigorous series of tests at the Littleton, Massachusetts laboratory of Curtis-Straus, a division of Bureau Veritas, to confirm our product meets the safety and electromagnetic compatibility standards for the CE Mark. This certification is required on any electronic equipment imported into the European Union. In addition to satisfying requirements for the CE mark, customers using the HVX system can feel secure in knowing that this equipment was thoroughly reviewed and tested by engineers in an independent lab and found to meet all applicable standards. Safety testing ensures that the design complies with regulations governing 120V/240Vac power distribution inside the equipment to adequately protect operators from electric shock under various operating conditions, and that in the event of a component failure or internal electrical short, the system will automatically shut down by fusing or other means, and will not create a fire hazard. Part of this testing involved shock testing. This consisted of dropping a 0.5 kG steel ball from a height of 1 meter onto the case during operation, applying a similar force to the unpowered power jack, and dropping the tester on each corner of the case. Other tests involved placing it in a 97% relative humidity environment to see if internal shorts were created, checking the Lexan labels applied to the case to be sure they did not burn, measuring leakage current from the DC power supplies, and installing 60 temperature probes inside the equipment to monitor internal temperature during operation. Because of the hazardous voltages produced by this equipment, the lab required additional testing to ensure that, in the event a short developed on the high voltage board, the system would immediately shut down without creating an electric shock or fire hazard. They accomplished this by intentionally introducing a short on the board during high voltage operation and monitoring the response. Also, because our high voltage board uses a custom-designed transformer to generate the AC test voltage, they needed to disassemble one of these transformers to confirm that the firm who built it allowed adequate spacing and insulation. Electromagnetic compatibility testing ensures that the HVX tester does not emit interfering levels of electrical noise that might affect other equipment, and that the system will not be adversely affected by environmental electrical noise, conducted electrical noise through the power lines, or electrostatic discharge. To prove that the system did not emit noise above the allowed limit, the test lab placed it in a sealed room and slowly rotated it in front of a sensitive antenna while it performed a high voltage test. Immunity testing involved focusing a radio beam at the unit, also on a rotating table, while a transmitter swept through a wide range of frequencies as the unit was performing a high voltage test. The unit must run its test to completion without interruption to pass this test. Electrostatic discharge (ESD) testing posed the greatest risk to the equipment. For this test, the test lab used a special ESD simulator "gun" to apply +/ 4kV discharges to the case, switches, control panel, USB cable, and other places all over the equipment while the HVX performed a test to confirm that the system would not stop functioning given these environmental insults. A reference document. Click to read.